Located in the historic town of Greyabbey on the Ards Peninsula, surrounded by the Rosemount Estate and the shores of Strangford Lough. The Cocktail Bar at the Salty Dog Hotel & Bistro is known for its wide selection of cocktails, local ales, bottled beers and wine by the glass. Situated right on the quayside of one of the most picturesque harbours on the coast. 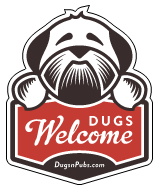 There are a total of 7 dog friendly listings in the Down category. Please log in, or sign up as a member to view all listings.